When a folk emergency strikes, you can always lean on Hank. 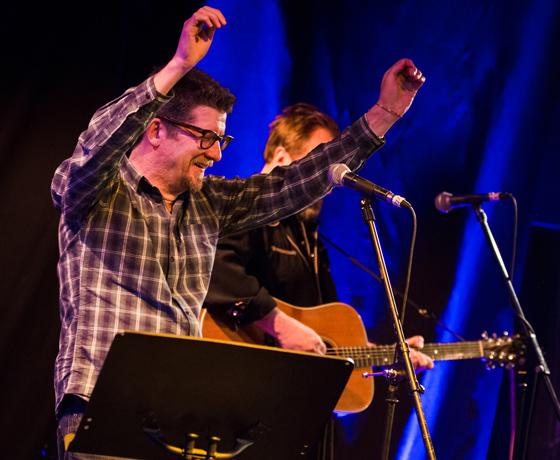 Performing as a duo, Andy Maize and Josh Finlayson of Toronto's Skydiggers began their night-closing In the Dead of Winter festival set with City of Sirens track "Hello Beautiful Life" when Finlayson's guitar completely cut out from its amplifier. While a helpful sound guy rushed to troubleshoot, Maize, without missing a beat, stepped away from the mic and began hamming it up for the crowd, shimmying and twisting like a knowingly awkward dad dancing at a wedding. Finlayson changed up the chords and soon the two were performing a (literally) unplugged take on Hank Williams' "You Win Again." Then, when the guitar problem was solved, they picked up on "Hello Beautiful Life," right where they left off. More than 25 years into their career, the Skydiggers' performances seem to come so naturally, and their songs are delivered with such classic poise, that the unexpected detours were welcome. Maize continued to play the ham through the show, with an eager audience — the sort who cheer when they recognize a song's opening chords — more than happy to laugh along. "We're doing nothing but lectures in 2015," joked Maize, pointing at the professorial-looking music stand by his side. The stand was actually there to hold his iPad, which served as a lyrical aide for some of the band's cover songs, including pretty versions of Ron Sexsmith's "Just My Heart Talkin'," and Gram Parsons' "One Hundred Years." Most of the show, though, stuck to Skydiggers standards, with the set leaning heavily on the band's self-titled debut and 2003's Bittersweet Harmony. From "I Will Give You Everything" to "California," the duo's set was as sweet and endearing as Maize's dance moves.